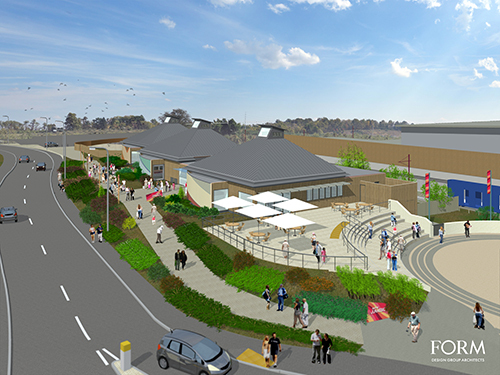 Seaton Jurassic is the new exciting visitor attraction for East Devon that will tell the uniquely powerful story of the geology and marine ecology of the Jurassic Coast, England's first Natural World Heritage Site. The centre has been built on The Underfleet in the middle of Seaton, a two minute walk from the seafront and the town centre, adjacent to the new Tesco store and the Seaton Tramway terminus. It is also only a short walk to the Axe Estuary Wetlands. It will contribute to the regeneration of the town by attracting thousands more visitors. Since 2001, the community of Seaton (since 2007 in the form of the Seaton Visitor Centre Trust) has been working with the local authorities (East Devon District, Devon County and Seaton Town councils) and the Jurassic Coast World Heritage Team to develop a visitor centre for Seaton, to reap the benefits from the town's unique location as a gateway to the Jurassic Coast World Heritage Site and the Axe Estuary Wetlands. The project has secured over £4 million in funding from our three local authorities, the Heritage Lottery Fund, Coastal Communities Fund, the Garfield Weston Foundation, the Fine Family Foundation and the Blue Marine. The Visitor Centre Trust itself fundraised towards the Wildlife Garden. Seaton Jurassic opened to customers Easter 2016 and was formally opened by Her Royal Highness Princess Anne. The centre is run by the Devon Wildlife Trust. Although with the construction of Seaton Jurassic the Trust will have achieved one of its main aims we will continue to work with the Devon Wildlife Trust to support the centre and develop close links with the community. This Centre will be the heart of the community, and it has the community at its heart.